Our Cotton American Outdoor Flags are the best option when it comes to conjuring up the historical beauty of America's earlier flags. 100% made in USA, our cotton flags are the most widely chosen for draping over a casket. Rightly so, they have a warm, rich look and stand out due to their traditional appearance. 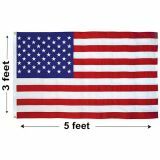 Tuff Flags offer two sizes in cotton, 3'x5' and 5'x9.5' If you're trying to decide if you should purchase an Outdoor US Cotton Flag please call us. We will give you the pros and cons of cotton versus the other materials. 100% customer satisfaction guaranteed! Tuff Flags offer cotton flags because they're such a wonderful way to honor our loved ones during a memorial service and for historical displays. Available in the interment size, 5'x9-1/2', and for historical use the 3'x5'. If used outdoors, Cotton US flags are best used for temporary events such as in patriotic events and parades. They are more expensive than Nylon and Polyester US flags, but their special qualities make them perfect when it comes to special moments such as laying a loved one to rest or a memorial service. Cotton American Flags are the most beautiful flags you can buy. If your intention is memorial or historical use, please take a look at out Cotton US Outdoor flags. Should you need more information or have any questions on their use, call us at (888) 287-3524 or email us at customercare@tuffflags.com.